Traditional well integrity status has limited use when not considering well type or well flow potential. DONG Energy used WellMaster IMS to follow up and report on the risk and integrity status of their wells. While the traditional well integrity status (traffic lights representing the barrier status) worked well for compliance reporting, it was not suitable for prioritizing well activities. DONG Energy wanted to use risk based reporting to help ensure focus on the most critical wells in relation to safety and environment. Risk based reporting helps ensure focus on the most critical wells in relation to safety and environment. To deal with this, DONG Energy developed the Well Exposure Matrix. Following a company defined standard, all wells were ranked with a Condition status (in addition to the well integrity status). This new status was then added to WellMaster IMS, where all wells were already ranked by their integrity impact level. 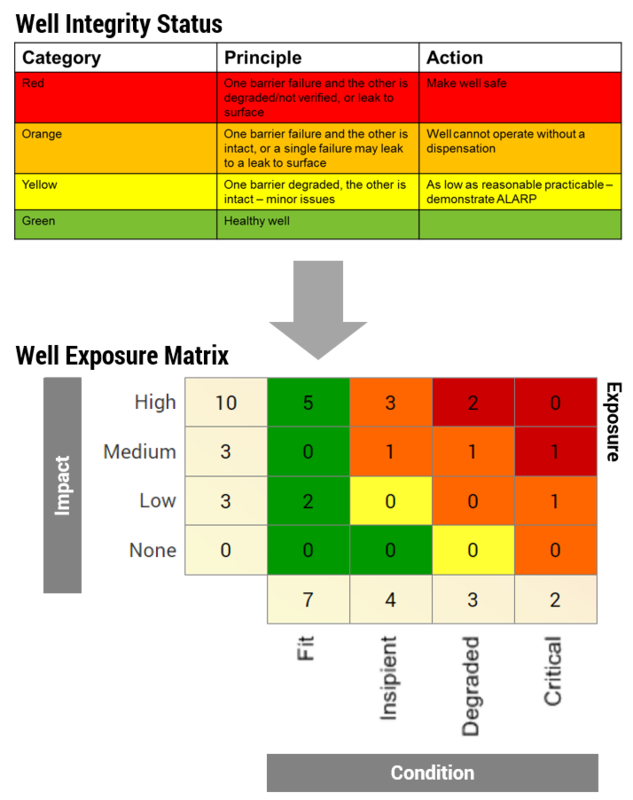 By combining these two dimensions (Integrity Impact and Well Condition) in the same matrix, DONG Energy were able to visualize and report on the wells’ exposure level. The result for DONG Energy is a solution that provides a risk based input to well prioritization. The matrix shows how for high impact wells even imperfections in condition can result in a high exposure. Or that for wells with less impact, a higher degree of degradation of barriers can be accepted as ALARP. Furthermore, reporting in the exposure matrix enables the company to compare the exposures to wells, topside, facility, pipeline, etc., in order to ensure right prioritization. Note: Integrity exposure does not replace formal risk assessments of specific issues and one shall always follow the responding to failure process if an event occurs.